Built in 1880,and first lighted the night of December 31, 1880. This is still an active lighthouse. It is equipped with a fixed red light with 1,000 watt lamps exhibiting 500,000 candle-power. the light is 112 feet above sea level. The lighthouse sits in the middle of the playing fields in Billingsport. 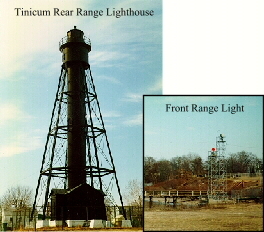 A group called the Tinicum Rear Range Light Society has been formed to maintain and open the lighthouse to the public. Plans call for the lighthouse to be open the third weekend of the month from April through October. 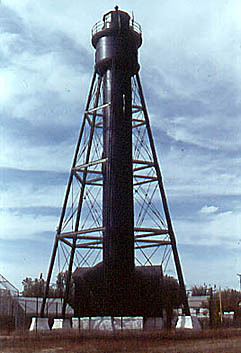 Tinicum Island Range - a skeleton tower stands on the foundation of the old front range light. The rear range light stands in a baseball field in Paulsboro. The rear range light is open the third full weekend of each month from April - October.